This is a painting of Abby. 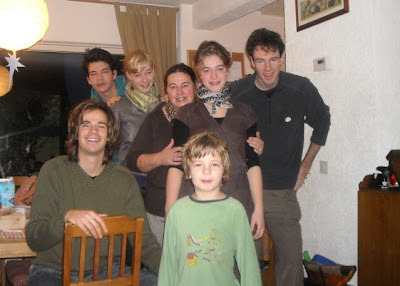 It was a gift for the wonderful time I had with her at home in Oosterhout, Netherlands. Its been about a week since I left. Our moment together was about as long. Yet, my goodness, it felt like much longer. Each day was either so full of feeling, challenge, or crazy cool cultural experiences that it felt like a week. We spent alot of time together in spontaneous little adventures and if there was a theme to our moments, it was honesty and openness. I learned more about myself in that week than I have in many months of my life. I am most grateful for this. We spoke much about our feelings about relationships and I had the pleasure of meeting the actual characters in her life. Each morning, we would share our dreams of the night, in which these characters often featured. As I painted this picture-- again without any preconceived plan-- the idea of dreaming seeped in. The circle of characters in her life also seeped in. It struck me that they swirled about her as if in a dream. Most of what they knew of Abby was a dream, an illusion, that even she seemed to be awakening to. Its a theme I can myself attest to: Finally awakening to yourself, being true to yourself, following your heart, and then as surely as the night follows the day, being true to others. I think this is one of the reasons I resonated so well with Abby. My journey has also been a process of awakening to myself. As I awaken, I more deeply embrace who I am and the road that my heart points me-- not just geographically but in relationships and in love. In the painting her eyes are wide open-- unlike the other characters. The dreamer awakes. Like a butterfly breaking out of its crystalis, she tests her new wings as they sparkle in the most resplendently fresh colour. She is poised for flight. It is beautiful to see someone awaken. It is beautiful to awaken. I write from a cafe right in the center. Wow. What a ride. I have to pinch myself that this is reality. And now, a beautiful woman has just sat down beside me. Time to close the laptop! This is now the end of this note. 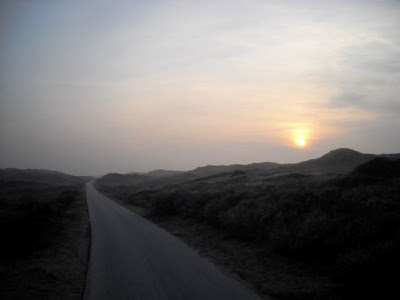 The last two days, I have been cruising through the coastal dunes between The Hague and Haarlem. Its been a dazzlingly ride. I can't get over how blue the sky is-- climatically and existentially. The cycle paths are amazing. However, its winter, so I am one of the few cyclists out there. Not only in terms of landscape, but of the people I am meeting and the blessings that befall me. I have actually really been looking forward to making my camp in this beautiful location. Yet, every night, something happens and I ended in a nice hotel, a hostel, and in general a warm bed. It is indeed pretty cold outside. That is frost you see on the bushes in the photo above. The universe is looking out for me! The other day, cycling out of the Hague into the night to set up my camp, I heard my name called from way off in the distance. Had it been my imagination? I stopped, didn't see anyone, but decided to fix my bike's lights anyhow. It turns out that my friend Bilal and his two friends had indeed called my name! They insisted on treating me to a night at wonderfully warm hotel in the center of the Hague. Wow. What a blessing that was. The next night, again, just as I was leaving a cafe to head out into the night, the owner told me about a hostel down the road. If I mentioned his name, they would give me a deal I couldn't refuse. And they did! Today I met with Denis, country coordinator for Humanity's Team here in Holland. We shared a fabulous connection over a homecooked meal. I depart inspired with a slew of new ideas and intentions for the 1Mandala project-- not mention the best sleep ever in his peace-full house. Again, I have no idea what is going to happen tonight. 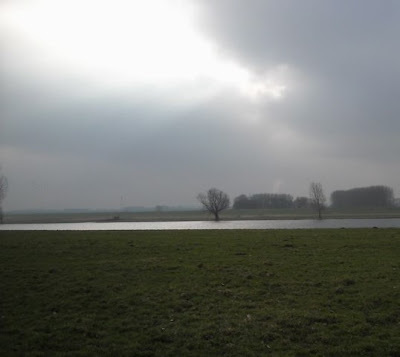 I head towards Amsterdam now and the intimidatingly non-rural landscape of the mythical city of openess. I've been meaning to post this photo for a week now. Last weekend, after joining a drop in Ultimate Frisbee training evening near Tilburg, I was invited to play on their league team that needed a player! They picked me up near Oosterhout and we headed off for a full day of plastic chasing fun in Amsterdam. Yes! The mythical city of Amsterdam. The team picked me up in Oosterhout and we made the 3 hour drive to Amsterdam for a full day of games. Everyone was speaking Dutch, it was a full out cultural sporting experience. I hadn't really played in 8 months, plus I had a bit of bruised heart, so my game wasn't exactly 100%. Its amazing how emotions can effect you. Yet, it was not only therapeutic, but fun. However, the reason I so adamantly wanted to post this is because of what the Dutch did at the end of each game. Ultimate, unlike football, handball or other traditional sports, doesn't have a referee and thrives on a truly exceptional and progressive spirit. It gets intense and competive, but never in a negative, divisive way. At the end of each game all the players gather around in a circle and put their arms around each other. A player from each team then comments on the game and wishes the other team well. 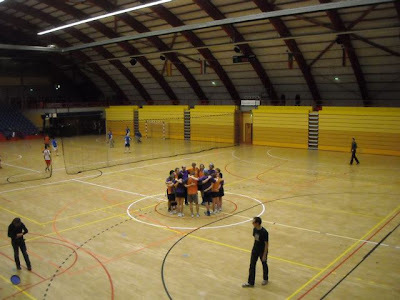 One of our players, observed at how different Ultimate is to his experience playing football in the Netherlands-- where everyone is tackling, jostling, arguing and generally being agressively more competitive. However, in the circle, any hard feelings that might have arisen over the course of the game quickly evaporated. It might look cheesy in the picture, but it was actually quite a profound and really effective conclusion to each match. Beautiful. If sports are a reflection of our social patterns and philosophies, then, there's hope in Ultimate! This morning I awoke in the town of Gouda, Holland. A dream had brought me here. Several days ago, in the midst of planning my trip Northwards from Oosterhout, I awoke with the name of the Dutch town of Gouda in my head. To my surprise, looking at the map the town actually fit beautifully into the trajectory I needed to make across Holland. I believe that we can gain much by remember, listening to, and indeed following our dreams. And thus I headed North towards Gouda. And thus, a week later, here I am. I rolled into to Gouda, toured around the town center, checked out the church, and bought some cheese. The whole time I kept my eyes open, expecting some sort of mystical experience to befall me. Alas, the sun was setting and I needed to get out of town to make camp. Passing by a quaint little pub, the lady inside gave me a friendly smile. I continued on a ways, but couldn't help feeling that if I had dreamed about this city, there was still yet something to experience. Inspired by the kind lady's smile, I returned to the pub, met all sorts of great people, had a few beers and I ended up staying the night in Gouda. The next morning, after rolling in to catch the Sunday service at the Gouda cathedral, and really when I had given up the thought of anything else happening to me while in Gouda, I met Franz and Goney. I was in the middle of Skype conversation on a park bench, when they invited me to pass by their place when I was done for a coffee. Not one to turn down a warm coffee on a cold morning, I knocked on the door of their vintage home in the historic center of Gouda. 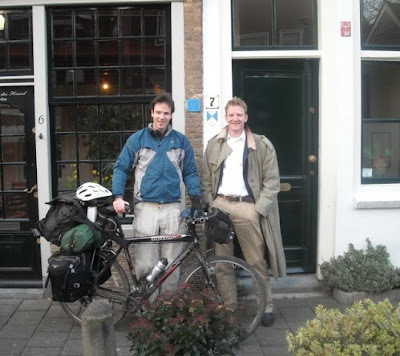 It turned out that Franz and Goney were veteran traveling cyclists! They too had been on long journeys, and they too had experienced the kindness of folks who had helped them out on their voyages! We connected immediately. I happened to be the first traveling cyclist they had ever met in their home town! They explained that they were overjoyed to be able to return kindness and assistance to a fellow cyclist on a similar voyage-- just as others had shown them kindness and helped them out. Wow. Talk about being at the right bench at the right time! A fabulous afternoon ensued! 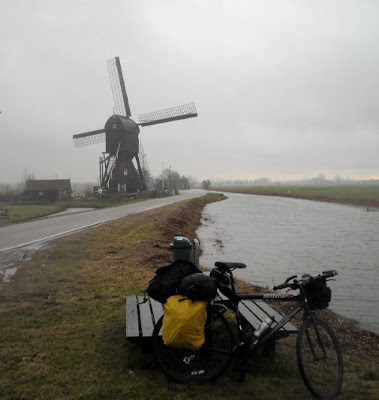 The best part (laundry, shower, coffee aside) was being able to talk to others who have experienced the same traveling phenomena as I have-- cycling through the countryside and the ease with wich one can connect not only with the land but the people. We shared story after story. Good experiences and the bad. We also compared traveling philosophy and principles-- not turning down kindness offered, taking the back roads, asking frequently for directions, taking our time without worrying about timing, letting the schedule and route evolve on their own while still having a focus and destination, traveling in plain cloths-- no fancy logo ridden florescent tights for us-- that way our choosen attire that doesn't intimidate others. It was so great to realize I am not alone in my thinking, ways and experiences! And, then, they treated me to an absolutely fabulous meal at a beautiful and elegant restaurant in Gouda's central square. Wow... red wine, roast duck starters, wild boar and a fabulous chocolate cake desert. If I would have been told yesterday that I would have been eating wild boar last night-- I would have laughed. I have some potatoes and onions that I bought from a local farmer in my paniers. Potatoes, onions and cheese-- that's what I expected my humble dinner to be. 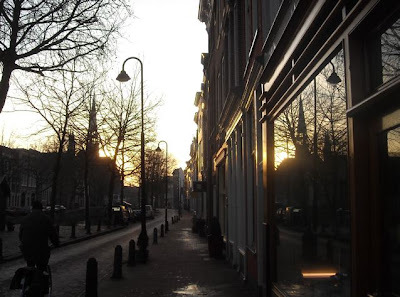 This morning, after waving goodbye to Franz and Goney, I rolled out of Gouda with the sun rising above the spires of the cathedral. It was then that I saw it: the window of local cheese shop. A flash of a memory came back from my dream. Deja vu! Tonight, I'll be camping on the dunes outside of the Hague. It will be considerably colder and more isolated! however, the memories of last night we certainly keep me warm. As Franz said, I've been warmed to the core! That's the lyrics from the song "La Vie est Belle" by Afterlieste, a Belgium band I have been listening to. There are definitely clouds in the sky today. The windy is blowing pretty hard. Its even pretty wet and rainy! But no... the sky is not grey-- can you see off in the horizon that tinge of pink? Greyness is state of mind, and I am not there at all today, despite the best efforts of the weather. I am cruising with joy. Its wonderful to be back on the open road. The Dutch countryside roars by me in a blaze of incredibly real stereotypical icons. Unending flatness, windmills, and canals, dykes and boats everywhere. Its the first time in my life, that I have had to adjust a shower downwards. Last night it was too high. Being tall, typically at a hotel, a house wherever, the shower head is too low. That's not to say that I was on a low. Far from it! Yesterday, while having a coffee in the small town of Woodrichem, Holland, the owner, seeing my laden bike, invited me to stay the night with her family. It was only 4 PM, I was expecting to cycle alot more that day. However, it was rather wet outside, and still I had lots of work to do, and, well... it was truly a kind and timely offer. But it wasn't just kindness that I experienced. It was an overwhelming warm, generous, and fun welcome by the nine members of the Liefe family-- most of who were well over 6ft tall! The dinner table was overflowing with not only good food, but people! Two sisters, five brothers and Mr. and Mrs. Fiege. Matthias, the youngest taught me some new Dutch. Jim and I talked religion and middle east politics. Andrianna and I talked art and design. Then, over evening tea, the family and I sat around talked late into the night about culture, Canada and the world. I was even able to show them my 1mandala project online. What a wonderful evening! And, what a warm, loving and together family. Grace was said together before dinner. Everyone ate together-- with jovial jokes between the generations. The grandparents had even sent Jim some fruit that we had afterwards. All the siblings were not only interesting to talk to, but confident and clear in their conversation-- something that is surely inspired by growing up in such a thriving family environment. Aside from the little matter of the shower head-- what a blessing! I left warm and ready for the road ahead. This is just a quick note to celebrate my survival last night. My winter sleeping bag worked! Camping in a beautiful Dutch forest, it hit a frosty -1 C. Yet, I was almost too warm in my sleeping bag! Hurray! This bodes well. Today, I set off. I leave comfort, I leave the known, and I push off into the fantastically daunting Unknown. 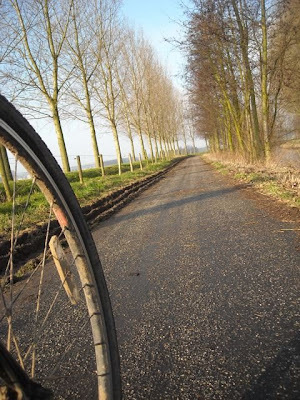 After taking a day to organize my stuff, fix my bike, and harmoniously conclude my time in Oosterhout, I cued my special iPod playlist and pushed down on the pedals. I headed down Abby's street and came to the familar highway intersection. All my wordly possesions are on my bike. Rather than turn to the right like I normally would, I turned to the left. The sun glistened off the road, a faint breeze began to blow, a hawk dived through the sky. Holly molly... I am off! I am confronting Fear head on. Two weeks ago, I could barely imagine I would actually do this. Europe is experiencing one of its coldest winters. My route, to Berlin, heads North. I have only one other friend in Holland to pass by, and after that, I know no one. My Dutch is very basic, my German non-existent. I have no idea if my winter sleeping bag is going to be warm enough. I've have even been invited to take a trip to warm Morroco and Spain, and I have even have been offered a cabin in Belgium rent free for the Winter. But the road calls. I feel it deeply. And so, following the call of my heart, my path, I plunge into the unknown. Its been about a month now that I have been taking a geographic lull from my journey. The journey has certainly been continuing at another level as I've been passing through intense lessons of life and love. It felt quite right to take my prolonged Christmas, Wales and Holland break. Indeed as I left Oosterhout, the very timing, down to the hour felt deeply right. I couldn't have left earlier, or later even if I wanted to. The threads of many different experiences tied together that morning with a harmony I could never have dreamed of orchestrating on my own. Viva la Vida plays as I type at a small cafe in Woudrichem, Holland. I shiver. I can say only one thing for sure. Sadness, exhilaration, joy. Onwards I go! Today is President Obama's historic first day in office. You only have to glance at a newspaper in your country to know that this is a moment that unites not only America, but the world. Obama's words and image and the symbol that he represents are echoing around the world. Wonderful. In my travels, people all over have been talking about what this represents. I think it represents, at last, a reflection at the highest level of all the good vibes that have been building amongst everyday people around the world for a long time now. I wanted to add this little post to the flow and to the momentum. It is a joy to be able to travel so freely and wonderfully at this moment of my life. Yet, for every joy, surely there must also be sorrow. Friends, lovers, cities great and small, towns quaint and cold, days hot and humid, wet and grey. They all pass. The goodbyes are as inexorable and as many as the hellos. As I prepare for the road yet again, sadness wells. As surely as the sun rises, it will set. As surely as two souls intertwine in a blaze of blue sky and golden sun light, just as surely the dusk shall fall, the sky will grow dark, and the last rays will sparkle as one's fingers tips slip out of the other's hand. I made this Mandala back in December. It was for Abby, who I have been staying with again this week in Holland. It was a parting gift of gratefullness for the wonderful time I had spent with her, for her hospitality, generosity and friendship. As I prepare to embark on the road again, the same warm feelings overcome me. It feels appropriate to share this now. 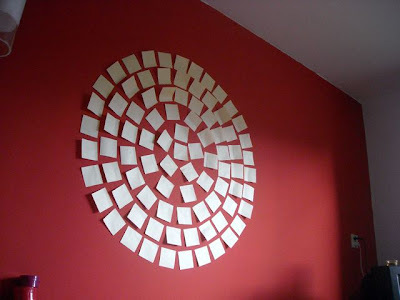 I first got the idea of using post it notes to make a mandala comes from a friend of mine, Amy in NYC. However, the idea for this particular mandala came from a dream. Its a very simple configuration-- one that I probably wouldn't have picked consciously. Yet, that is what I dreamed. It is my experience that it is a good thing to follow your dreams! An interesting thing has happen in the time that I was away. The post it notes on the wall have been filling up! The post its were used by Abby and her friends to leave notes. These, then got cycled into Mandala! The once blank and basic mandala is now filled with sketches, notes, scribbles, and life. It captures a moment of a friends and connections. I love Ultmate. For those of you who don't know, Ultimate is an amazingly cool team sport that is played with a frisbee. Alas, due to my travels, I haven't been able to play for 8 months. Last night, in a gym outside of Tilburg, I got to play. Wow. It was sooo much fun! Between points, sweating and trying to catch my breath, I stood on the goal line with my impromtu team. I thought to myself: "This is amazing-- I am traveling the world, doing my art, learning a new language, and playing ultimate! Does life get any better?!" 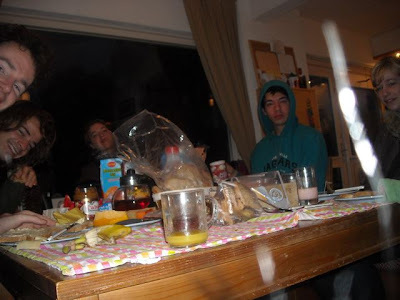 It was also a definitive Dutch cultural experience. I had come with pure Netherlanders Abby and Job from one Dutch town to yet another. Everyone was speaking Dutch. Everyone was working or living near by. And everyone was super friendly and helpful! There's nothing like being locally immersed in a great group to speed up one's learning! Its been about three weeks now of Dutch practice and I am proud to say I was able to make my first public joke! We had to go around a circle and introduce ourselves, and share our favorite type of cheese. You know you're in Europe when that is the ice breaker question! Everyone was listing fancy stuff-- Job said something about cheese with walnuts and an aroma of honey. "Ik bin Russell. Lik een goede Northamericanish, ik likker eider kind om kaas als hut is op ein hamburger!" "I am Russell. Like a good Northamerican, I like any kind of cheese as long as it is on a Hamburger!" At least a few people understood my bastardized attempt and laughed! To top off a fantastic evening, I've been invited to join the team and play in a tournament in Amsterdam on Sunday! "You and I" by Russell Maier - 1999. Oil pastel, Digital Composite. 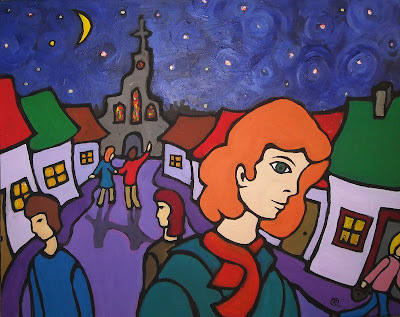 A decade ago I painted this picture. Way back then, Love and Fate were on my mind. This was the meditative creation that ensued. As the Earth spins around the sun, far below a river curls through the land. On it's banks mighty oaks stand nourished by the golden rays that flood through the cloudless sky. In the swirling river, leaves have fallen and have been whisked away. Ordained by a trillion variables, the leaves follow their course. The only certainty in their swirling route is the ever changing onwardness. Yet, like dancers, two leaves come together in the current. Together they swirl about each other in the most intricate ballad-- close, then far, touching, then apart. At one point they seem hopelessly distant, then suddenly their currents bring them rushing together again. Their dance together seems an eternity-- a blessing of fate, yet as fragile and fleeting as the clouds that begin to move across the sky. Alas, the same currents that brought them together also wrests them apart. Around them other leaves dance. The sun beams. The river flows. The currents cascade. Clouds streak across the sky. The earth spins and hurtles onwards in it's own cosmic dance. Whether its a few days, a few months or fifty years, Love seems destined to mean coming together and parting. For every begining there is an ending. For every moment of happiness there must also be sadness. One leaf taps out a feeble blog on his iPod as he tries to make sense of it all. Out the window a new day is rising. The Rotterdam sky is tinged with pink. It looks like another cool, clear, crisp day. I too am feeling cool, clear and crisp. Yesterday, after fasting, yoga, mediating and a long walk through the city, I cleared both my mind and soul from the cob webs of Christmas. The flow has taken me from a dazzling day in London, back to Holland and now here to this spectacularily avant guard city. Having returned to Europe I must now transition from the sumptuously sedate holidays to the focused fervor of January-- I too as an artist am not immune from this! Its a transition that I welcome. I am deeply looking forward to getting back to my art. Yet, as I move on some major questions lurk in my soul unresolved. What is love? What is a relationship? Does love mean togetherness? Can love also mean parting and going two separate ways? Does love mean just one person? What is it that I feel? Its been a day without food. I take my first bite of a sumptous orange. I am consuming a mandala. The radiating pattern of crescents strikes me as strongly as its bright colour this morning. The taste is sweeter and stronger than usual. 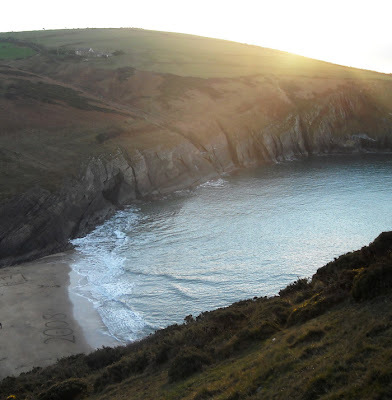 I've had an amazingly rich and wonderful Holidays in Wales with my lover Louisa. Out of grattitude and joy I have painted her portrait as a gift. The painting turned out completely different than what I had invisioned. Swept away by my intuition, I painted from my heart. 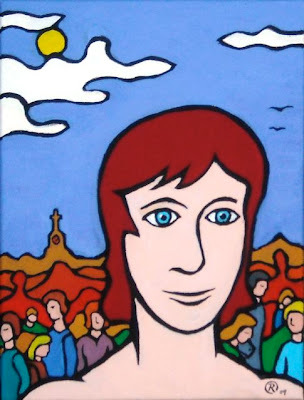 The painting aspires to capture Louisa's essence as well as a multitude of our richest moments. Its an amalgam of moments and places in a way that only a painting can capture. Like all relationships, ours has also involved intense moments of truth, confronting of deep seeded fears, and tending the others fears and struggles. The painting captures my own processing of our time together. I may have been the one who painted the picture, but I stare at it with more curiousity than I think anyone else ever will. Art is a truly a way to converse with ones's soul. The painting took a life of its own. Each element a symbol that speaks to me of moments and people and places. The conjunction of moon and evening star, the candle lit in the window, the woman walking off the scene, the person who looks a lot like me walking away down the street-- none of these things I planned, yet incredibly they mean an immense amount. The painting is more honest than words can ever aspire. Perhaps that is its greatest gift. Creating art is such a fantastic process. I highly recommend it. When I lead workshops I see children to adults discovering new things about themselves. I am a professional artist, yet I still am dazzled by just how wonderfully revealing art making can be. Last night, I had a quintessential English experience. Driving into London, I found myself in a traffic jam on the the M25. Its not the type of experience you see advertised on English travel brochures, but surrounded by hundreds of others, I couldn't help but ponder our shared moment. The M25 is the ring road that entours London. It struck me that surely as many English folk who have visited Stonehenge or Westminster Abbey have experienced the geographical space known as the M25. In fact, given that going in and out of London you must use it, and if the thousands of people around us are a sample of days and years past, even more people have probably been here! The other day I read something about the lost civilization of Atlantis. Questions of history aside, there was a seperate idea in the article that struck me. The article claimed that despite the fact that no metal Atlantean artifiacts have ever been unearthed, Atlantis was a civilization more evolved than ours. The narrator suggested that was in fact more evolved because it didn't require the use of metals and all the related industries in its realization of civilization. The reality of the bleak, packed, and pollutted M25 experience that so many endure is a consequence of our civiliazation's use of metal. These traffic jams are a consequence of the M25. How advanced is our civilization if it requires enduring such a space for even 30 minutes a day? Many of course commute for hours each and every day on this space. 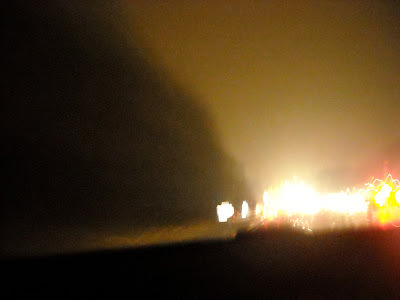 While waiting for a major accident to be cleared the happy and cheery vibe in our car changed dramatically. Was it just us? Perhaps it was the culmulative effect of hundreds of others around us and their building frustration effecting us. It would seem that there must be more evolved and advanced ways to live. Hurtling down a winding Welsch road on the last day of the year, the crescent moon rose in the violet horizon. Venus, the evening star, shone with uncanny brightness by its side. Suddenly, a flock of sparrows erupted from the trees in the distance. 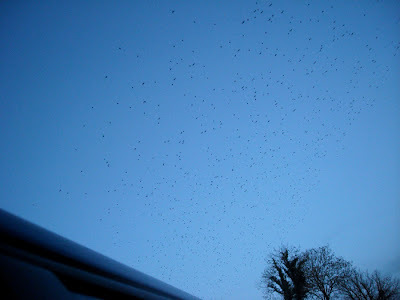 Hundreds upon hundreds of birds streamed across the road in front of us. It took a good thirty seconds to reach the flock that still continued to flowed across the road. As we passed underneath the last bird wisped past. Since I was young I have taken the passing of a flock of birds as a sign that God is with me. I remember opening my eyes after saying a prayer and seeing a sudden flash of birds fly by. It made me shiver with reassurance. As I contemplate my path into the new year, I look ahead with combination of immense apprehension and profound grattitude. On the one hand my last seven months of travel have been enormously blessed. Technically I should have starved in a French ditch long ago-- yet my weight and health and inner peace have never been better. 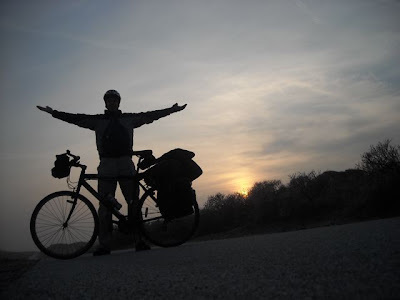 On the other hand, I feel drawn to continue my cycle across Europe-- I had originally planned to stop in Berlin. Looking at the map the other day, my eye crossed over a myriad of daunting sounding countries in Eastern Europe and the Middle East. If I indeed continue, it will be one heck of a journey. Christmas Day, I found myself in a 700 year old Welsch chapel with Louisa and her family. I was overcome with a singular sensation: I am poised to have one of the most amazing years of my life. As the birds flooded by on the road, the feeling echoed on. I spent the last day of the year watching the sun set on the Irish sea. From our perch on a rocky crag overlooking the ocean, Louisa and I watched as the '2008' that we had enscribed on the beach below was enexorably washed away by the lapping waves. It was a little poem composed of sand, time and tide. 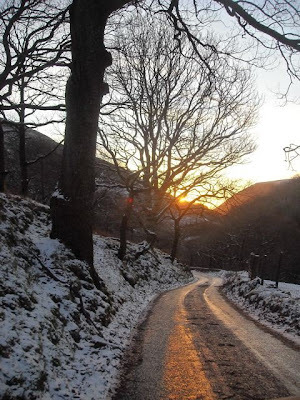 With the last golden rays of the day and the year illuminating the green Welsh hills it was a beautiful way to see the year end and a new year begin.